It is the world's largest urban square used for public gatherings. A half million people can comfortably stand in it. The square has been used for many prominent ceremonies, parades and protests. It is also a popular spot for kite flying, family strolling and tourist sightseeing. In 1949. from the high rostrum of the Gate of Heavenly Peace entrance tower, Mao Zedong proclaimed the China People's Republic to the multitude standing in Tiananmen Square. 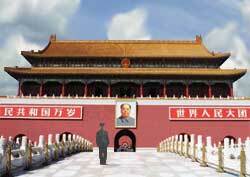 Many other Chinese leaders have viewed May Day and International Labor Day parades from that perch. The embalmed body of Mao is on public display. Each year millions of Chinese citizens line up to view it. It houses a 10,000 seat auditorium and a 5,000 seat banquet hall. Has relics dating back 2.5 million years. Also has exhibits on the Chinese Revolution. Situated near the middle of the square.